When I comment on Trump-related matters, I explain the world through the lens of the wisdom of #Kabbalah, which sheds light on the fundamental laws of nature that shape the global and collective #development of humanity. 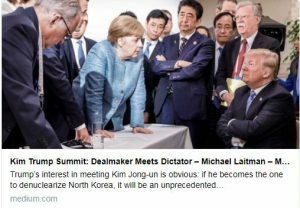 Coming straight from the #G7Summit in #Canada, Trump will carry on with the same approach: positioning himself for getting the best deal possible. Trump’s interest in meeting Kim Jong-un is obvious: if he becomes the one to denuclearize North Korea, it will be an unprecedented achievement for America, for the world, and for #Trump himself, who will be remembered in the history books.